AMMAN, Jordan (CNS) — An emergency is developing within an emergency, aid workers warn, as the European Union has decided to shut its doors to those fleeing war zones. Up to 40,000 people are believed to be stuck throughout Greece as border after border to northern Europe has closed along the main route through the Balkans used by more than a million people since the migratory wave began a year ago. Fleeing conflict and poverty in the Middle East and beyond, refugees and migrants have poured into Europe since early 2015. Most have traveled in unsafe boats on a dangerous sea journey from Turkey to Greece before heading through the Balkans to Germany and lands farther north. “Many are unsure about what will happen to them,” Joshua Kyller, emergency coordinator for Catholic Relief Services in the Balkans, told CNS by telephone from the Greek capital, Athens, where he is based. Kyller said that as restrictions tighten on government permissions to remain temporarily in Greece, concerns are growing about what the aid groups will be able to provide legally in terms of humanitarian assistance to the refugees. In early March, EU leaders announced a tentative deal with Turkey to return thousands of migrants to the country in exchange for resettling Syrian refugees housed in refugee camps in Turkey. “Irregular flows of migrants along the Western Balkans route have now come to an end,” said Donald Tusk, president of the European Council. The logic, according to the plan, is if the Macedonian border with Greece can be closed, then the refugee crisis gripping Europe can be contained in Greece. And if refugees can be returned to Turkey, then damage to Greece’s cash-strapped economy may become somewhat manageable. Greek political leaders fear their country is being turned into “a warehouse of souls,” as fewer refugees are able to enter northern Europe legally. Refugees and migrants stranded at Greece’s border with Macedonia vowed to remain in place. But the U.N. refugee agency and others have expressed concerns over the prospect of “blanket returns” of refugees from Greece to Turkey, saying such action violated international law. Vincent Cochetel, European bureau director for the U.N. refugee agency, UNHCR, said he was “tired of hearing about irregular migrants” because 91 percent of those arriving in Greece are from war-torn countries like Iraq, Syria and Afghanistan. Kyller said that even before the EU announcement, restrictions were being placed on various groups of refugees entering Greece. Syrians and Iraqis were given priority status over Afghans, Iranians or Pakistanis. The former were allowed to remain 180 days in Greece as opposed to 30 days for the rest. But even if papers for Syrians and Iraqis indicated that they had spent more than 30 days in Turkey before entering Greece, authorities told them that they had already overstayed in a place considered “safe” and were told to return to Turkey. Also, if their town of origin in Syria or Iraq was not under threat, they were informed that they did not meet the criteria requiring international protection, Kyller added. “Idomeni (at the Greek-Macedonian border) represents a large bottleneck now of this flow of migrants and refugees moving northward,” Kyller said. Roughly 13,000 people are currently stuck living in muddy squalor, he said. 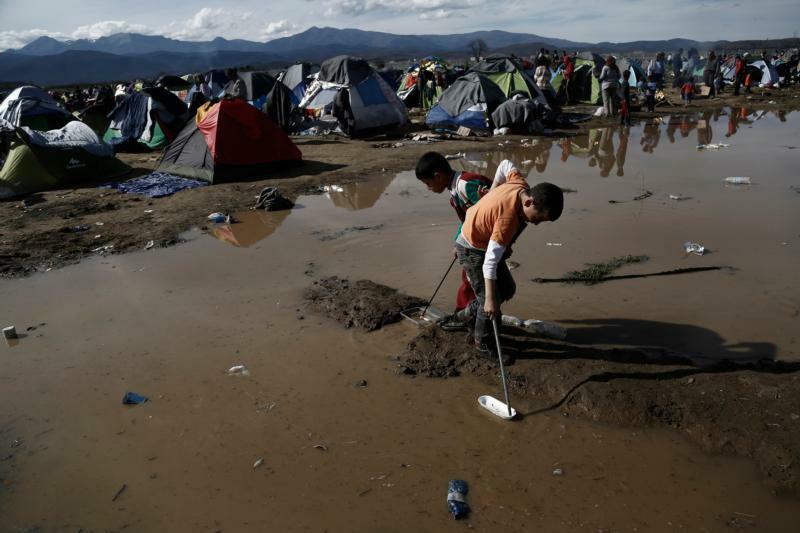 CRS, the U.S. bishops’ international relief and development agency and a member of the international Caritas aid federation, has been working with Caritas Greece in Idomeni “providing emergency food assistance to the thousands gathered there,” Kyller said. Cash cards are also given to the refugees to pay for food, accommodation and clothing. The refugee center at Caritas Athens provides hot meals for some 600 refugees daily as well as winter clothing to ward off the cold. Caritas also has opened a day center at Victoria Square near Athens’ main train station. Social workers assist vulnerable women and families. The center offers hot showers and rest places as well as information on medical service, asylum processes and legal rights. These Catholic agencies also work on the Greek islands where the refugees first arrive, as well as at Piraeus Port near Athens. “Assistance is often falling on humanitarian workers, NGOs and volunteers to take care of this caseload, and they do their best to manage these needs,” Kyller added. “I’ve never seen anything like it from a humanitarian standpoint,” he emphasized. “There are some 5,000 men, women, and children refugees at Piraeus Port sleeping on the ground in empty warehouses” due to a lack of other shelter. Still in the midst of the crisis, hundreds of refugee children managed to play the biggest game of “Duck, duck, goose” Kyller has ever witnessed. “There is some laughter and joy, even in the midst of chaos,” he said. Kyller expressed concern for refugees and migrants also being smuggled out of Greece. He said this particular challenge has deepened as increased numbers of vulnerable people, including women, children and unaccompanied minors, have entered Greece since the start of the new year.